3-Dimensional polymer printing technology (PRT) uses digital imaging to render industrial prototypes for manufacturing. We proposed that newer 3-D PRT could use digital CT and MRI images of the human body to create highly accurate reconstructions of normal and pathological anatomy. After determining institutional IRB exemption, our group obtained completely de-identified images of interesting anatomic pathology in CT and MRI format. These images were uploaded, and electronically highlighted using advanced 3-D computer aided design software to create usable 3 dimensional representations of the anatomy of interest. Rendered images were transmitted to a commercial entity. The models were then created using advanced 3-dimensional polymer printing technology utilizing different colored and textured resins/polymers to emphasize tissues/lesions. The created models were reviewed by a surgeon and a radiologist to determine anatomical accuracy. Validation of size ratio from CT and MRI images to translated models was performed. All models were validated as being highly accurate representations of the CT images. A select image of the type used to create the models is included below, as well as several photographs of final products. 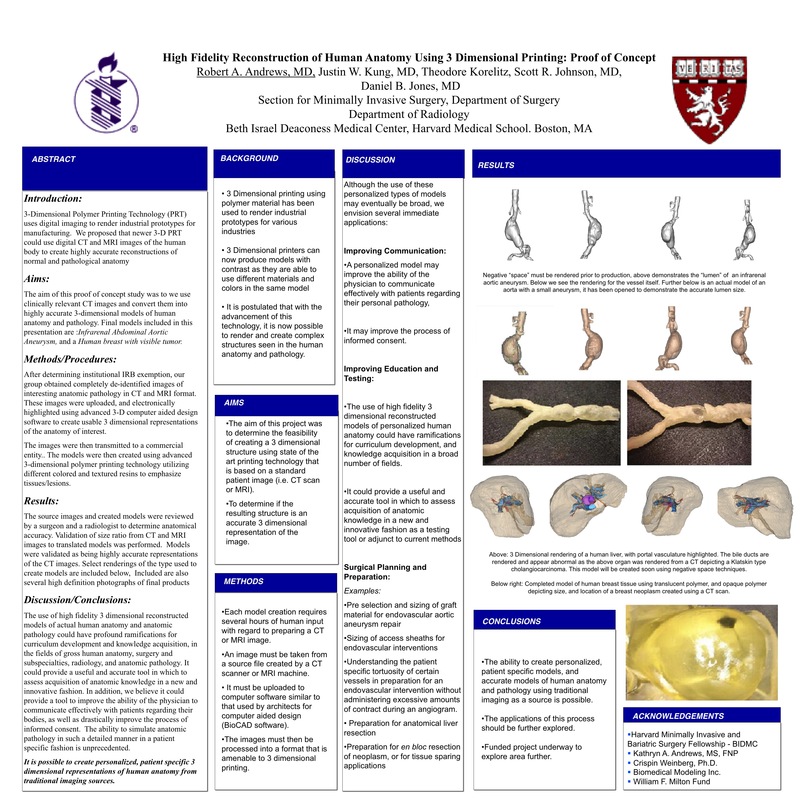 The use of high fidelity 3 dimensional reconstructed models of actual human anatomy and anatomic pathology could have profound ramifications for curriculum development and knowledge acquisition in the fields of gross human anatomy, surgery, radiology, and pathology. It could provide a useful and accurate tool in which to assess acquisition of anatomic knowledge in an innovative fashion. In addition, 3-D modeling may improve physician – patient communication, especially with regard to the process of informed consent. We have successfully translated patient specific radiographic images into 3 dimensional models, proving that such modeling is feasible. In the future we plan on expanding the scope of 3 dimensional modeling to include many different types of tissues and processes.